Sections – The highest structural element available and can contain one or multiple rows. 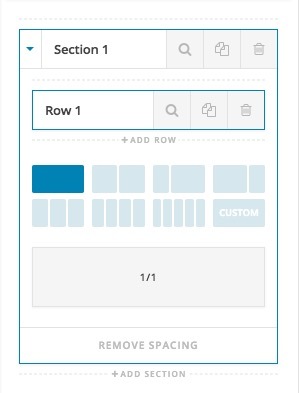 Depending on the design you’re going for, you may be able to fit numerous rows inside a section, or you may only want to use one row. Sections can be spaced out as needed, but for the most part, you will want them to stack on top of each other for a consistent page structure. Rows – After you’ve started off with a section, you can then add rows to that section. Rows can be spaced out from one another as needed or be stacked on top of each other. Columns – These are the most granular structural element available and they provide the horizontal spacing between elements. When the browser viewing your website is 767px or smaller, columns will stack on top of each other for a responsive view. The spacing between columns on this mobile view must be added as needed (more on this later). Now that we understand some of the basics of the scaffolding that Cornerstone provides, let’s get into some practical examples. If you already have sections added, the Add Section link will be available at the very end of the sections list or in between them. The Handle – The large area to the left is known as the handle of the sortable item. 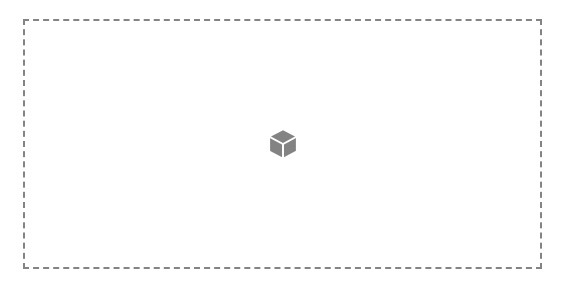 If you click and hold on it, you can drag the sortable item around. If you have multiple sortable items, you can rearrange them in a new order by doing this and whatever they represent will be reordered in the preview area. Magnifying Glass Icon – Clicking this will activate subpane of options to appear for further adjustments or highlighting a particular element. The Controls – For the most part, sortable items will have two controls that appear, which are typically duplication and deletion. 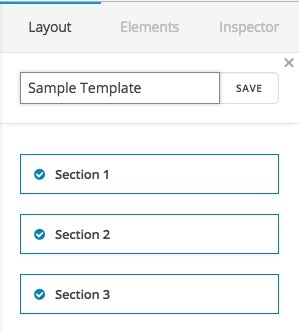 In the case of sections, they have an additional arrow section at the very left section which will open up the Row and Columns management options. Also, hovering over a section or Row will show an indicator of the place of that section or row in the Preview Panel. Next, we have another sortable control representing your rows. You can add multiple rows here as needed using the “Add Row” link below the sortable and can inspect, duplicate, or delete your row using the controls present. Finally, at the bottom of the pane, you’ll see the controls for choosing the column layout and order of the currently selected row. The Column Layout control dictates the overall structure of your row, while the Column Order control is a special kind of sortable which we will go over in a bit. When using the Column Layout control, you can use one of the seven predefined options, or utilize the Custom option, which will display an input and allow you to use additional layouts as needed. Columns cannot be any smaller than 1/6 and must add up to a whole (for instance, 1/4 + 1/2 + 1/4 would be an acceptable input). Finally, you’ll note that these controls also end in the row that is currently selected. In the preview area, our single droppable area has split into two droppable areas (1/3 + 2/3 due to our selection). The Column Layout control is highlighting the currently selected row’s new layout. The Column Order control has split from a single column (i.e. 1/1) into two to represent our new layout. Dragging the column into its new position is reflected in the preview area after we drop the column. Altering the core structure of your page nothing more than a few clicks and you’re good to go! The same type of structure within a section can be done for rows above by dragging their position up and down, but we’ll cover this in more detail in another article (note that by default rows will stack on top of each other, but you can alter their spacing by inspecting them and changing their margins as needed). Clicking on the Save Template button the list of available sections of the page will show, which you can choose to add to the template. At the very top section, you can add a name for the template and save it. 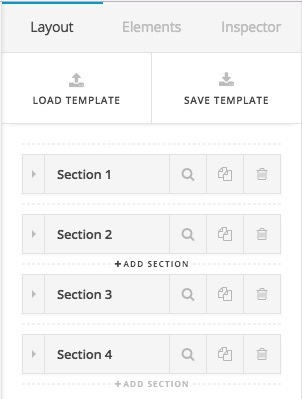 You can select all or some of the sections available on the page for a template. As soon as you save a template, it will go to the Template Manager and you can use it on other pages or export it to other websites. For more information about the Template Manager click here. 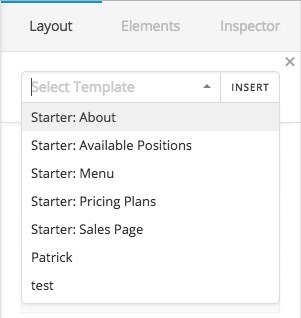 Templates are a great way to manage large pieces of content easily or utilize them across multiple installations if desired. If you happen to be using Cornerstone as a base builder across numerous projects, this can prove to be an invaluable tool to easily bring your library of trusty blocks and pages with you wherever you go. There is also another feature available which is called Global Blocks which you can use to have a central place to do changes and see the changes applied to the whole website. For more information click here. Underline effect on links not appearing? Copy a Row from One Page to Another?